In Friday’s episode, Randy Fenoli partners with the Georgetown bridal salon. Hitched Owners Julia Lichtman Kepniss and Carin Rosenberg Levine. Photograph by Astrid Photography. Graphic courtesy of Hitched Salon. 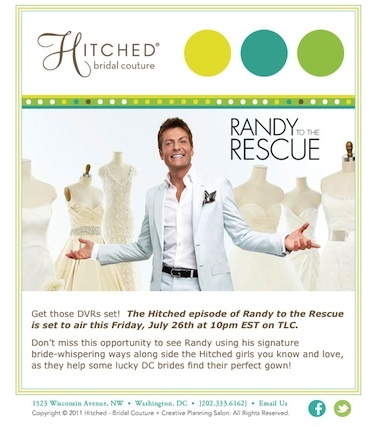 The last time we caught up with Randy Fenoli, star of TLC’s Randy to the Rescue, he partnered with Hitched Salon on a pop-up bridal shop to rescue some local brides. 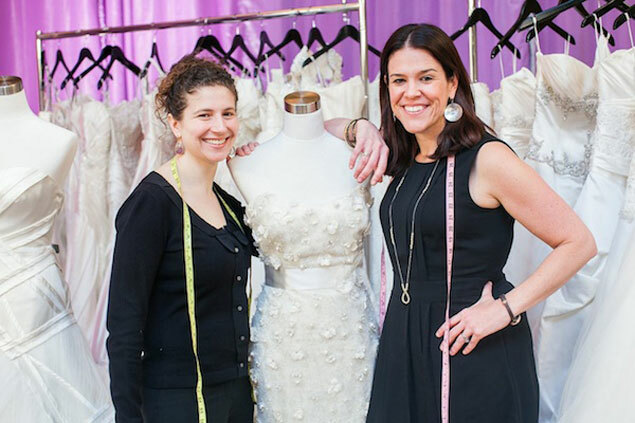 After Randy, with the help of the Hitched consultants, helped 40 Washington brides narrow down their wedding-dress options in a huge bridal trunk show, the bubbly wedding genius went on to offer three lucky women one-on-one appointments—which viewers can see of more in tonight’s episode. Tune in to TLC at 10 for the full episode, and read on for our conversation with Carin Rosenberg Levine and Julia Lichtman Kepniss, the fashionable duo behind Hitched Salon, who got to spend an entire weekend in March getting to know Fenoli. Carin Rosenberg Levine: TLC called in and asked us if we would partner with Randy to the Rescue when the show came to DC. It’s the first time we said yes to reality television—we thought this sounded like a fun opportunity, and how could we say no to Randy? Julia Lichtman Kepniss: Over the years, we’ve been approached by reality shows about having Hitched featured, and we’ve always shied away from it because it never felt like the right match. I think this is a really positive show. They are not looking to create drama. This is really what it feels like to be shopping for a bridal gown. For us to be involved in the show has been something very positive and true to life. It was a good first taste of reality television. What was it like working with Randy? JLK: As you can see on the show, he has a larger-than-life personality. His personality is so warm, helpful, and giving, and he just has the right touch with brides. We’ve been calling him the bride whisperer. One treat of this experience has been getting to know him personally and seeing that he is the same man off-camera as he is on. CRL: I think Randy really understands the emotional part of buying a wedding gown and how important it is to feel amazing and beautiful, and how there is a lot of anxiety surrounding that. He truly cares about the brides and would do almost anything to make sure they have the look they were hoping for. What’s Hitched’s role on the episode? CRL: Hitched consultants are in the show, but the idea is that this is Randy’s store—it’s Hitched behind the scenes, but it’s Randy’s store. We will service the brides afterward and make sure they get their dresses. 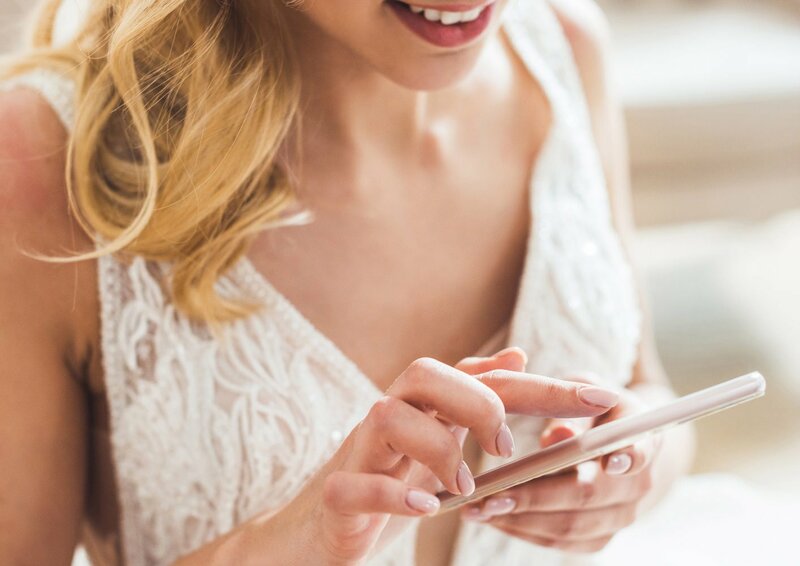 JLK: Because we are a functioning bridal shop in DC, we pick up where the show ends and continue the relationship with the bride throughout the planning process until the dress is ready to be delivered. CRL: We really focus on customer service and making sure the bride is having the experience she wants to have when shopping for the dress. You are kind of like an advocate for the bride as she is going through the process. One thing we really see is that Randy has a similar philosophy, so sometimes that means helping the bride’s friends understand what is important to her. To watch somebody else do it, you can see the similarities and differences and be like, “That’s a really interesting point that Randy made.” That was a very positive piece of this. JLK: It also allowed us to experience new dresses and designers. We are always looking for great new designers to bring to the Washington area, so this allowed us to get a taste of new dresses we don’t carry that we can go explore at the next market.